Non-skid bed surface resists load slippage. Perforated front axel reduces weight. 8" x 2.5" Flat Free low profile rear wheels with polymer hubs. 5" x 1.25" front swivel casters with brakes. Got drums, keyboards, PA, or DJ racks to move? Do your fellow band members vanish into the night at load-out time? Here's help on wheels! The Rock N Roller R8 cart is tough enough to handle 500 pounds of gear. Yet it only weighs 29 pounds to make it easy to manage! The Rock N Roller R8 cart changes shape to meet your gear-hauling needs! Its 8-in-1 flexibility allows you to use the R8 as a conventional 2-wheel hand truck or a 4-wheel carriage, all with a few quick adjustments. And here's the best part: the R8 changes from 2-wheel to 4-wheel mode in about two seconds! This cart will quickly become as cherished as your favorite roadie. The R8 features some Rock N Roll exclusive designs. The frame telescopes easily from 34" to 52" in length. The R8's non-skid frame bed surface resists load slippage. In addition, the folding sides rotate and lock into position by simply pressing release cables. In 2-wheel mode the R8 hand truck's long nose ergonomically pulls bulky loads toward you to make lifting easier. The Rock N Roller R8 uses patent-pending swivel casters that are very lightweight and strong. They also feature quick-change pop-off wheels for smaller storage profile and easy service in the field. The R8's Flat Free low profile wheels absorb shock to delicate equipment and smoothly roll over rough surfaces such as dirt, grass, and concrete. Specially designed polymer hubs with roller bearings are up to 40% lighter than steel hub wheels. Take a Rock N Roller R8 Cart to your next gig and save your back! Best move in a long time! This product superversatile, a lifesaver! This is the perfect hand truck Dolly for more than just your gear. Whether you have heavy loads or stairs to contend with this is the perfect tool for your Hand Transporting Needs. Thanks for making it. My orthopedist also thanks you too. The cart has worked very well for my purpose. Have yet to experience hauling through snow. Over all very satisfied. Love it! Strong enough for heavy loads! Folds small enough to fit in a small car! I have r8. Love it! help so much in residence moving! I bought this for hauling crates, etc. into dog shows. It's excellent. It handles well. I love the fact that the handle is high enough to just push it at waist height. I wanted something smaller than the normal crate dolly and this fills the bill nicely. This cart is great, I can load all my drums on it and save several trips back and forth from my car to the venue. It rolls very well over black top ,lawns and the stair climber makes it easy to pull it up over curbs. Since it folds up to a compact size ,it packs well into my car. Very satisfied with my purchase from Hand Trucks ' R' Us! Bought this gem for my hubby who has to load and unload his band equipment. It's very sturdy and the best part...it folds to make it more compact and easier to stow. I use it all the time now for any moving job...like gardening materials...etc. I tried other folding hand trucks, and ended up returning them for this one. Definitely worth the price. Things I like the wheel roll very well with grease added to the axle. the concept of expanding the length to accommodate a variety of items. it's built well and does not sag when toting equipment. Things I do NOT like the cable release mechanism. It's awkward to use. having to reach under to cart to undo the wing nuts when I have items loaded and then need to expand the cart having to remember which handle needs to be folded first, in order to fold it up. This cart is fantastic and has been a great help in transporting cakes to trade shows and Farmers markets. Awesome product and it fits in the trunk of the car. I wanted a hand cart that was easy for me to lift out and in the car.....this is it. Plus it holds all of my tubs, boxes and inventory? I can get everything into where I have to go in one load!!!! Love it and have recommended to other artists!!!! Moved a 4 bedroom house with this cart and am extremely happy with the product. The only thing it couldn't handle was the grand piano, although the cart is rated for 500 lbs. I still have a studio to move and the ROCKnROLLER will handle that without a problem. I've had one of these before and they are great! They fold up small for transport, fold out into a two wheel hand truck, short 4 wheel cart and a long 4 wheel cart. Holds more weight than I'll ever put on it. It's easy to maneuver. Everybody that knows I have it wants to borrow it! I received this cart in the middle of a roll out of LCDs for one of our customers. When I started this project I was a standard hand truck. For this type of work the hand truck was not the correct choice. But then came the R8Mid. This cart allowed me to not only carry many more LCDs, but gave me the ability to stage right from the cart. This helped me by making fewer trips to the vehicle for refills and also allowed me to work faster. I started using this on a daily basis and it has held up well. Better than expected. I also like the fact that they offer replacement parts and that means a lot to me. I am absolutely satisfied with this cart. This is one fantastic piece of equipment. It is easy to store and to set up to load. I carry a lot of equipment and props in my show and this cart allows me to load a lot of items which greatly saves me trips from my car. Excellent product! Must have for Horse Showing. Purchased this because I travel with my Grandaughter to Horse Shows. It is so handy for moving tack trunks, hay and everything else you have to drag along. Wouldn't be without it. Well worth the money because it saves your back! This cart move my entire 6piece kit, including hardware in an SKB case, plus cymbals and fan in ONE trip! Don't wait any longer to get one. And you can't do better than Hand Trucks R US! I purchased for my husband that carries his musical equipment from place to place. He is saving his back and getting there and loving this piece of equipment. He is able to carry so much at one time effortless. If he loves it, I do too!!!! I now have 6 of these carts and couldn't be happier! Compact when folded, huge when opened, lightweight and affordable! 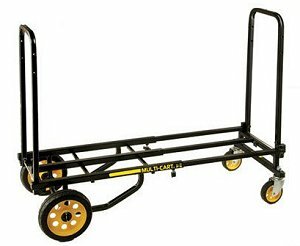 I use this cart for hauling musical gear and working at festivals on the weekends. This cart is extremely durable and its worth the money. Don't hesitate to purchase!! I had been using a bulky, heavy, pneumatic tired hand truck. On the way into a gig the front tire went flat. All my equipment went flying and the glass on my ipad broke. I went home that night and ordered the Multicart that I had been looking at for months. Wish I had done it sooner. So versatile. Very light and much quieter than my old hand truck. One of the best purchases I've made in a long time! At first glance there is not much to the Rock n rolla multi cart. However that is the beauty of the cart. Easy to use, strong, durable and easy to enhance. We have many uses for this cart. As a company we liked it so much we bought two. It's fabulous. Carts heavy loads over grass and extends out to be large enough to make less trips. It's light and compact with super tires that don't blow out. Everything I've ever wanted in a hand cart. I'm extreamly pleased. It was recomended to me by another artist and now I'll recomend it to anyone who asks what I think of it. This is a great product, exactly what I was looking for. I love the ease of use and the ability to make it fit my size load, no matter how big or small! Furthermore, the collapsible ability makes it easy to maneuver in and out of my car.